Ministry of Earth Sciences (MoES). Who can forget December 26, 2004? The tsunami, the devastation and the death. Millions lost life and many more lost the desire to live. There was sympathy empathy and apathy. Descriptions and prescriptions. Reactions and responses too. Many were ‘moved’ then life ‘moved on’… This tsunami tends to fade away in the pages of history… Three years down the line, Coordinates visits those for whom the tsunami is still a possibility, a reality and a challenge. Do we have well-established tsunami evacuation procedures? Mandates are divided across various ministries to do different things. As a science ministry, it is our mandate to issue warning for Tsunami and inform those agencies who are supposed to take care of the mitigation. It is largely the Home Ministry which is responsible, through their large access to paramilitary forces and other organizations to organize evacuation. The district administration reports to them. There are other authorities, such as Disaster Management Authority, who are making sure that such capacity building mechanisms come up in the country. However, I am also aware that the country has good preparation which you can see when the recent cyclone struck two months ago. A massive exercise of shifting people was undertaken by these arms of the government, and was done very well. When it comes to evacuating people, the method is not different whether you have to relocate because of cyclone or tsunami. TEWS has not undergone realtime testing. Please comment. For an event, particularly in the Indian Ocean which happens once every 60 years, you obviously cannot have a frequent real-time testing. But if you look at it as a science, you don’t need an earthquake or a tsunami of that magnitude to test the system. A system consists of various elements. In this case, we have sensors at the bottom of the ocean, various tide gauges, seismological equipment, and we are getting seismological data from across the world. Each of these individual systems is tested 24 hours. For example, we have placed the Bottom Pressure Recorders (BPR) at the depth of, say, 3km which gives a reading every hour. So we know whether the recorder is working or not. It is also highly accurate. We know how the variations take place with respect to the normal tides so we know exactly how the BPR is working because all these tides have a definite mathematical model. Similarly, the tide gauges are also tested. The seismological equipment is tested very frequently because there are so many earthquakes taking place at a low magnitude. When these work for low magnitude, they will also work for high magnitude. Most of the equipment is being tested and monitored by computers on a 24 hour basis. What if the central processing unit of the BPRs fails? The systems are planned with a sufficient amount of redundancy. We have established the system with six BPRs – four in the Bay of Bengal and two in the Arabian Sea. Our original configuration is actually for twelve BPRs to maintain very high level of redundancy. When it comes to the actual detection of the tsunami, one BPR on each side is sufficient. We have placed four. For data correlation, we will further multiply this redundancy. The ocean is a very difficult environment. Maintaining the equipment is difficult, particularly when the sea is rough for about four months. Thus the complete chain of sensors has more than 100 per cent redundancy. Any one failure should not cause any problem with respect to the functioning of the system anywhere in the chain. High level redundancy involves multiple players. Is accountability an issue? As far as the availability of TEWS is concerned, the responsibility lies solely with MoES and its operational unit, Indian National Center for Ocean Information Services. We are not in the blame game as in who failed and who succeeded. If there is failure, then it is our failure. But I must say that the supporting organizations whether it is Indian Space Research Organization, or Ministry of Science and Technology or even other institutions which are in the forefront, like National Institute of Ocean Technology, are playing a very important role. Maintaining the observation system of the BPRs on the ocean bottom is the most difficult task in this exercise which NIOT is doing. Everybody is committed to their task. Is the cadastral data available for evacuation routes? We have very detailed information on the coastline and are in the process of updating that further with the help of Department of Space and National Remote Sensing Agency. They are using various platforms including the imaging capability of CARTO-1, which has a resolution of 2.5m, quite accurate for this kind of application. They are also using aircrafts with Airborne Lidar Topograhic Mapping System sensors for very accurate information to the measure of 0.3m. Survey of India has done some very good work. Similarly, even in the coastal region, we have a lot of useful information from the Indian Naval Hydrographic Department (INHD). Changing coastlines do not affect tsunami related issues. Firstly, the changes are slow. Secondly, when we look at tsunami, we look at inundation. Suppose we determine that the wave height is going to be 3m. Our maps will immediately show the areas likely to be inundated and we are more worried particularly around cities with high population density. MoES seems more focused on atmospheric and oceanic sciences. Please comment. Normally, one thinks that Earth means geology. We are trying to change that notion. The solid Earth, or geology, is being addressed by the Geological Survey of India (GSI) and other organizations. We focus on Earth systems to understand how the ocean, atmosphere and earth couple together. We also have the seismology division in the Indian Meteorology Department as a focal unit to support the overall coordination in seismology in the country. So these are the issues we are addressing right now. Our emphasis is lot more on ocean and atmosphere as a total system largely because this is where maximum scientific understanding is needed. When we are talking about new problems like global warming and climate change, they are ultimately related to the Earth. How will local bodies translate the TEWS warnings into concrete actions? This is one area which is very important and we need to do a lot. We have really not done much. Our next effort is to address this. Our unit INCOIS in Hyderabad is trying to coordinate with all concerned people, collectors and district officers in the coastal region. So this is one area where we really need to strengthen in the coming years. Do you see MoES playing any significant role in NSDI? This initiative originally started with the interaction of SOI and DoS. It has now become an institutionalized mechanism under the Department of Science and Technology (DST). There is a high level committee being chaired by the Honorable Minister of Science and Technology and Earth Sciences. Earth Sciences is represented by the Secretary, MoES, so we are part of it. Operationally, it is appropriate that DST is creating a separate cell from the SOI. Our role is related to coastal management and all the information which we need for our warning systems, inundation mapping, storm surges, cyclone warning – each of these requires correct and accurate information along the sea coast. We are also the provider of such information. Everything has to be part of NSDI. 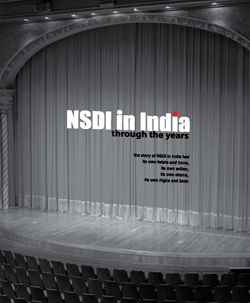 Thus, we are involved in the NSDI. This is the right mechanism because if everyone wants to lead, there will be chaos. It is a deliberate decision to let DST take the lead role in NSDI. Following the Asian earthquake and tsunami on December 26, 2004, the Indonesian government created the Rehabilitation and Reconstruction Board (BRR) to manage all state and international aid for rebuilding the Aceh and Nias regions. The BRR’s current mission is to provide housing for hundreds of thousands displaced tsunami victims and to rebuild destroyed infrastructure systems, including transportation, water and waste management, as well as communication systems. Coordinates presents the views of the representatives of BRR and Autodesk. Following the Asian earthquake and tsunami on December 26, 2004, the Indonesian government created the Rehabilitation and Reconstruction Board (BRR) to manage all state and international aid for rebuilding the Aceh and Nias regions. As the executing agency, our vision is to build a reliable, dignified, prosperous and democratic Aceh and Nias. In the Indonesian Government’s Master Plan for the rehabilitation and reconstruction of Aceh and Nias, we further have the mission to provide housing for displaced tsunami victims, and to rebuild destroyed infrastructure systems, including transportation, water and waste management, as well as communication systems. Could you elaborate on the need for the WEBGIS framework? BRR collaborates with all aspects of Indonesia’s infrastructure reconstruction and works with government agencies, international donors, and more than 150 non-government organizations. With such a large network of partners, we faced a serious and increasingly important challenge: sharing information quickly efficiently to ensure everyone has the most current data. In the past, we could only distribute our extensive inventory of spatial data and maps offline or by providing hardcopy paper maps, but this was obviously time consuming and costly, but also highly frustrating for agencies and organizations waiting on the information. These constraints limited the use of our spatial resources, and as a result, the Aceh- Nias reconstruction efforts were impacted. We needed a way to effectively manage, access, and distribute up-to-date spatial data and to focus on designing and establishing the best possible systems for long-term application. 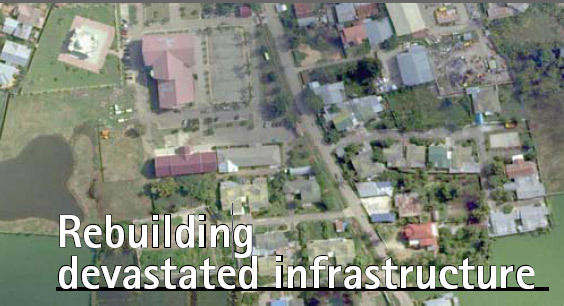 We knew that a single Webbased system that allows stakeholders to download spatial information directly from our database would greatly help reconstruction efforts. The WebGIS is a Web-based system that enables BRR to effectively manage, access, and distribute the agency’s extensive inventory of spatial data and maps to our partners involved in the reconstruction of Ache and Nias. It is a communication vehicle that provides a visual perspective of the land in the format of a map, which can then be used by our partners and stakeholders as reference materials to plan their reconstruction efforts. How prepared is BRR in adopting such systems? The BRR works with a large network of partners and knew that a single Web-based system that allows the BRR’s stakeholders to download spatial information directly from the BRR database would greatly help reconstruction efforts. One of the biggest advantages we have found in working with Autodesk geospatial technology, is that our staff are familiar with the AutoCAD interface so there was a short learning curve with the new Autodesk WebGIS system. The user friendliness of the system also made it easier for our partners to understand the data available at a single glance as well. Autodesk also stepped in and provided free training for our team, getting them up to speed quickly so that the team could begin using WebGIS immediately. What has been the response of the users and impact of this system? The most important benefit we have experienced with the WebGIS is that it has significantly enhanced the flow of information to the relevant agencies and NGOs involved in the reconstruction project. Not only has the Autodesk WebGIS system significantly improved and standardized the quality of data available, users can also instantly download spatial data and high-definition maps directly from BRR’s centralized database to get updated information on the status of the reconstruction project. This has helped save up to four hours of time a day – A stark contrast to our previous methods of disseminating hardcopy paper maps, which put serious constraints on our already limited resources. Do you think that the BRR case study can be replicated? The BRR case study is a great example of how geospatial technologies can be leveraged to further the rehabilitation and reconstruction of disaster-stricken areas. The applications and lessons are certainly applicable in other contexts. Autodesk has provided its design technologies in the United States, after Hurricane Katrina devastated the Gulf Coast. Autodesk worked with Cleveland-based Adenium Systems and fellow sponsors McGraw- Hill Construction and Cisco Systems to give local architects and builders access to design tools for rebuilding New Orleans and the surrounding communities. Developing countries being price sensitive, how to you “tailormake” your offerings? Public sector and government agencies across both developing and developed countries often face the challenge of balancing cost and performance. However, our customers who are interested in leveraging technology effectively do tend to look beyond the initial projects costs, towards the longerterm, sustained benefits of the solutions they implement. For example, by working closely with BRR to help them develop a Web-based GIS publishing system to efficiently and accurately share data with various stakeholders across the country, BRR was able to reduce their geospatial data development and implementation costs by 95%. What about the userfriendliness of the solution? The combination AutoCAD Map 3D and Autodesk MapGuide Enterprise used to develop the WebGIS system for BRR enables users to distribute complex, precision data online via an intuitive and easy-to-use interface to a wide audience of technical and non-technical colleagues and partners. Using FDO Data Access technology, an open source software tool that provides seamless data integration for multiple proprietary GIS formats, users have a single view of their information and save time by reviewing data directly from the map without the hassle of data translation or conversion. After the tsunami of 26th December 2004, which caught the world unaware and unprepared, India is among the few countries that moved quickly and positively to establish a world class tsunami warning system, which is now in operation. I congratulate India for this achievement in a relatively short period of time, which was only possible due to the dedicated hard work and discipline at various levels of the Central government, state governments, the governmental institutions and the academic and research institutions of India. I understand that ten ocean bottom pressure sensors are being located in the Bay of Bengal and two in the Arabian Sea to monitor in real time the deep water signature of the tsunami. It should be noted that, the three main sources of tsunamis that can affect India are the Sumatra region, the Andaman region and the Mekran region in the Arabian Sea. With the upgrading and installation of new seismographs, new tide gauges, coupled with the ocean bottom pressure sensors, India is well prepared to meet any eventuality. While instrumentation is a basic component of any early warning system, just as important, is the software, or the numerical (computer) models that provide the intelligence on how to interpret the real time data in a very short time and make objective decisions. The full scope of the tsunami early warning system is much more than instrumentation, computer models and a tsunami warning Centre. It also encompasses, public education, raising of awareness, involvement of various levels of government and NGOs and long term planning. India is well on its way to address all these issues. Even though no two natural disasters are exactly identical, there are some commonalities and the knowledge and experience gained from natural disaster can be used to advantage. One of the topics that needs attention is the plight of physically challenged people during a natural disaster, especially when it involves evacuation.